Some of you know that I am away from Ireland presently due to family reasons. As such, I’m very sorry to be missing the very first Pro Silva Ireland Close-to-Nature forestry management day in my home area. 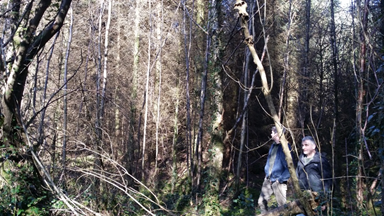 I work voluntarily with the committee of Pro Silva Ireland who are organising this event (22 April 2017), to develop awareness of the growing conversations and real examples of this alternative forest management approach throughout Ireland. My involvement with Pro Silva Ireland (established in 2000) to help with their communications, means I get fantastic advice from leading Irish and international foresters (Pro Silva Ireland is part of a pan-European forestry network) for Hollywood’s transformation into a resilient, mixed age, mixed species forest. Such knowledge feeds directly into my eco-social art practice, where conversations, the social learning from foresters and landowners, informs and motivates my long term creative practice. At this event, I’m particularly delighted to know the experience of how commercial plantations planted by a local farmer, Peter Rose, are being managed for continuous cover, will be shared with a local audience (and others who are coming from across Ireland) who would perhaps not associate innovative forestry practices with Carlow. Also, the event in Carlow will be special with the launch of the first full-colour comprehensive and practice guide to Close-to-Nature forest management for Irish forests. Padriag O’Tuama (past Chair of ProSilva Ireland) has worked hard to have this fully illustrated practical guide made available for the growing interest in continuous cover forestry in Ireland. There will also be discussion, of the importance of the freshwater pearl shell mussel in the Blackstairs valley area and how permanent forest management can be a positive management strategy for this endangered Irish species. Please feel welcome to attend if you have an interest in alternative forest management and how forestry is changing in Carlow. Details below.